2 new LEGO sets online! 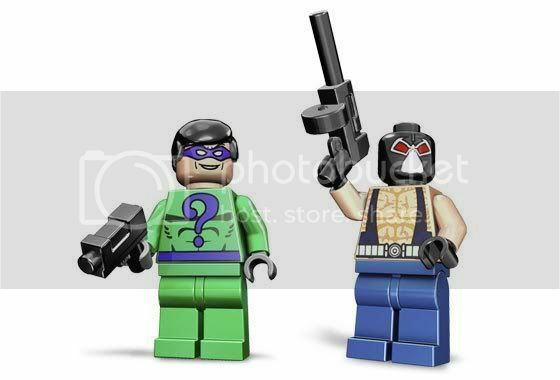 Lego has the new Scarecrow and Riddler/Bane sets online for order! DCD Trinity Figures Concept Art! the first Dark Knight Promo! Hot Wheels Con Exclusive 1966 Batmobile! We've got the latest offerings from Dc Direct, due in shops Feb 2008! 1st look at the Dark Knight toyline! this has been removed at Mattel's request. theBatmaster01 has taken the time to share is extensive collection on the forum with us! Love TiVo? Win big in the “My TiVo Gets Me” video contest. Prizes include, Plasma TVs, TiVo® HD DVRs, trips, season tickets to your favorite sporting events, and more. Contest ends June 15th. Click here for details. New The Batman TRU 4 pack! The LEGO online store has a new Riddler Lego Keychain and a third magnet set that includes Batman, Mr. Freeze and the Riddler! Click HERE to check 'em out. Our LEGO toy archive has also been updated with the images and info.